Zombie Crowd Zombie Crowd is really a good title for the one in action games. You are starting the game as a zombie. 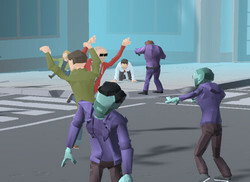 A zombie… You may walk through normal people to make them zombies and join into your team. Make your zombie crew more crowd. The map shows normal people with white circles. Red circles mean another zombie crowd. Don’t go near to zombie crowds unless you are a very crowded zombie crew. Remember that a more crowded zombie crowd destroys the fewer one in action games rules.